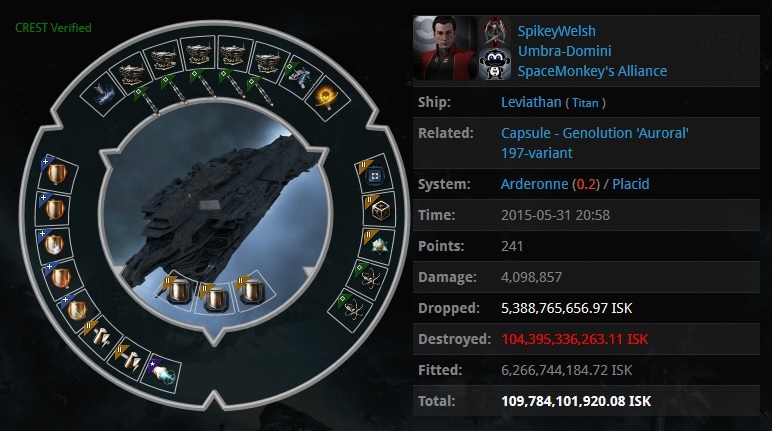 On 2015.05.31 a Black Ops fleet from Snuffed Out [B B C] alliance dropped on a Leviathan belonging to SpikeyWelsh from SpaceMonkey’s Alliance [SMA] in low-sec system Arderonne. SpikeyWelsh does not have any kills with his titan and his killboard activity suggests that it was recently acquired as in February it shows regular ships in use. Therefore implying it’s potential use in bridging fleets. Upon contacting [B B C] for comment there was little intel about the actual tracking and killing of the titan, however [B B C] was more interested in mentioning that they gained the location of the titan through an unconfirmed CEO spy in [SMA]. [21:23:53] Aon Flux > was there an active hunt for the titan or was it a coincidence that you found it? [21:24:22] Aon Flux > of course. Additional info from [B B C] can suggest that the titan pilot tried to dock at the station in Arderonne. [21:22:13] Aon Flux > was the titan caught on a POS? The following picture was provided by [SMA] and shows a negative balance on The Lone-ranger’s wallet. SpikeyWelsh is the founder of Umbra-Domini, a corp still in [SMA]. 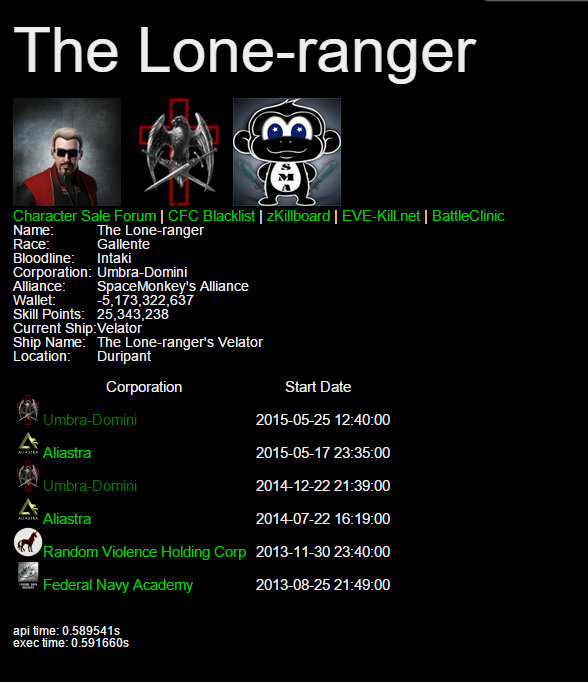 The Lone-ranger was listed as the CEO of Umbra-domini on www.evewho.com, but the info now shows a new CEO. [SMA] confirms that The Lone-ranger was asked to step down as CEO and leave the alliance due to nefarious handling of corp funds, as possibly shown in the above image. [SMA] also confirms that SpikeyWelsh is the titan toon of The Lone-ranger. 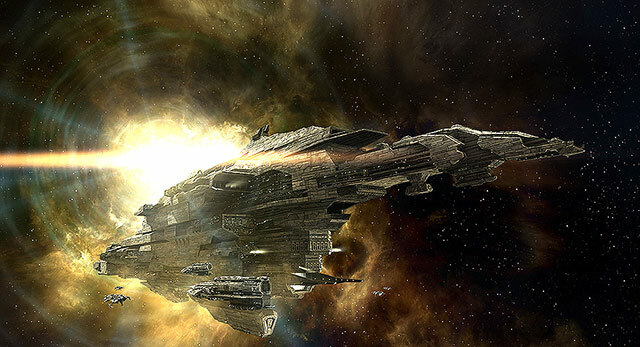 There are no reports to why the pilot was in that system, but if the reports from local chat are true then SpikeyWelsh was not aware that titans and supers cannot dock at stations. This is basic titan and supercarrier knowledge. It appears that [SMA] has kicked out a CEO with a titan toon due to possible RMT and another player in [SMA] alliance with ties to [B B C] tipped them off with the location of an easy titan kill. Never a dull moment in EVE. [SMA] and [B B C] have both contributed to this article. However, at the time of writing SpikeyWelsh has yet to comment. Update: As is evidently clear the reports involved modified comments stating that the pilot tried to dock in system, even though it had no station. The actual method of death was following cynoing into system, the pilot cloaked on grid whilst leaving the cyno alt in position, therefore when the ship was probed down it simply took some burning around grid to decloak and tackle. Kii5Md your blog. I too am an aspiring blog writer but I am still new to everything. Real nice style and excellent content material , hardly anything else we require : D.